Today’s site of the day is Absolut Machines, awarded the Epica D’Or (Interactive) earlier this week. Between February 28 and April 25, 2008, visitors to Absolut’s website were invited to create original musical compositions by feeding notes to two remotely stationed, state-of-the-art “artificially creative” machines, in New York City and Stockholm. The machines converted those notes into tunes using a variety of unusual instruments, broadcasting them live at absolutmachines.com. The site, though still live, is no longer fully functional, having been disconnected from machine installations. 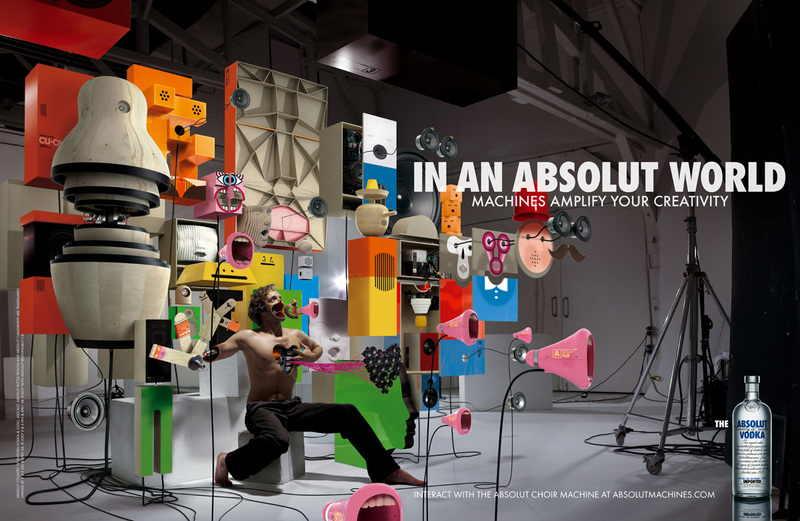 The Absolut Machines campaign, launched on December 17 2007, began by following the creation of the two music machines, created by Dan Paluska and Jeff Lieberman, from Massachussets Institute of Technology, and Teenage Engineering in Stockholm, Sweden. Dan Paluska and Jeff Lieberman created the Absolut Quartet, an automated multi-instrumental orchestral machine, a large-scale electromechanical sculpture consisting of three instruments and thousands of parts, working together to create one piece of music. The main timbre was a marimba played by balls shot from a robotic cannon. Other components include a series of wineglasses played by little robotic fingers and an array of robotic percussive instruments. The fourth member of the quartet was the web site visitor. The Absolut Quartet was located in a gallery on Orchard St, New York. Teenage Engineering constructed the Absolut Choir, a multi-channel robotic choir, composed of 22 singing characters of various shapes and sizes, an architectural installation with an advanced framework of speech synthesizers and artificial intelligence software at the back end run on Linux. The choir was located on the 3rd floor of the Pub Department Store in Stockholm. Throughout the project’s life, visitors to the site were able to follow the work in progress, download high-resolution images, films, interviews, biographies, and find in-depth information about the project. The campaign was promoted using a range of print advertisements in trend magazines. V&S Absolut Spirits staff on the project included Ulrika Lövdahl, Karl-Johan Bogefors, Kristina Hagbard, Jesper Andreasson and Patric Blixt. 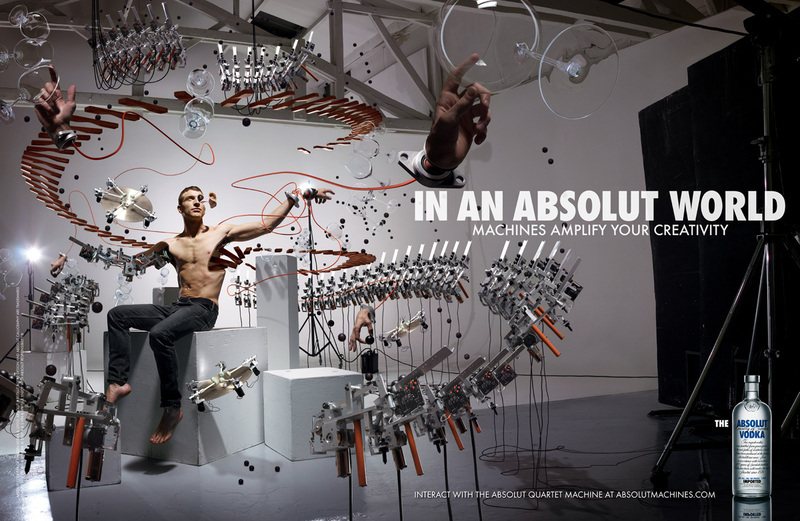 The Absolut Machines campaign was developed at Great Works, Stockholm, with additional creative support from Frankenstein, Stockholm, TBWA\Paris and TBWA\New York. Staff on the project were creative director Ted Persson, account manager Magnus Wålsten, creative director/art director Mathias Päres, creative director Sebastian Vacherot (TBWA), planners Saher Sidhom and Joe Konietzko (TBWA New York), project managers Charlotta Rydholm, Kaj Bouic, Christelle Delarue (TBWA Paris) and Cilla Winbladh (Frankenstein), production managers Linn Tornérhielm and Jocke Wissing, creative director/art director Pontus Frankenstein (Frankenstein), designer Fredrik Karlsson, photographers Erik Hagman and Sesse Lind, producer Ola Löfgren, technical director Micke Emtinger, producer David Katamari. Dan Paluska and Jeff Liebermann worked together as “Plebian Design”. The Teenage Engineering team included Jesper Kouthoofd, David Eriksson, Björn Sjölén and Jens Rudberg. PR Consultants were Jung and Noise Marketing. The event team was Knock. The print campaign was developed at TBWA/MAP, Paris, France, by creative directors Sébastien Vacherot and Manoelle van der Vaeren, art directors/copywriters Julien Boissinot and Nicolas Pontacq, and photographer Laurent Séroussi. The Absolut Machines ad won a Gold Lion at Cannes International Advertising Festival, 2008, a Cresta winner award, 2008, the Epica D’Or and a Gold Epica award, a silver award at One Show Interactive.